Not a year passed by without my dad buying Jamon de Bola (a kind of ham shaped like a ball), Queso de Bola (a cheese ball with red wax covering), and fireworks for our New Yearâ€™s Eve family dinner party. This year, itâ€™s the sameâ€”but minus the fireworks. My mom has increasingly been paranoid about using fireworks through the years. It used to be just an annoyance that using fireworks was a waste of moneyâ€”hard-earned cash blowing up together with the fireworks display. But for the past few years, it was more on the safety concern. And I donâ€™t blame her. Seeing blown-up fingers and charred flesh isnâ€™t exactly appetizing when youâ€™re eating dinner and watching television on New Yearâ€™s Day. But believe it or not, my dad and I used to be at odds with my mom on fireworks when I was younger. My mom despised watching me and my dad waste money on different kinds of sparklers and loud fireworks. But we really enjoyed it, especially the preparation of our pyrotechnic display. My dad would take me to the market to purchase fireworks a day before New Yearâ€™s Eve, and we would stock them up in a cabinet like soldiers preparing for a battle. An hour before New Year, we would ready our â€œgearâ€ and head outside the house with my mom and sister grudgingly following behind to see our display. Well, those were the daysâ€¦ I guess when we get older, we become more careful (although I know quite a few people who are exceptions to this generalization). 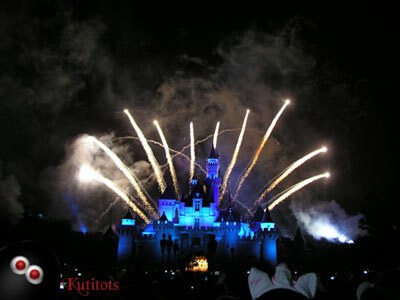 I still enjoy watching fireworks displays like in the photo I took above (thatâ€™s a fireworks display Marc and I saw in Hongkong Disneyland on our honeymoon), but I prefer to be just a spectator now and not the one handling the fireworks. Maybe Iâ€™m just becoming a sissy, but I honestly donâ€™t want to risk damaging my hands or my eyes (it would be pretty difficult to design websites and blog when body parts are missing). I think my dad feels the same, and so does Marc (although I think Marc didnâ€™t want to get fireworks this year because theyâ€™re expensive hehe). This entry was posted on Sunday, 31 December 2006 at 4:57 pm and is filed under Holidays. Happy new year Gail and Marc!! May this coming year bring more projects for us!! When I was much younger, I got excited to light firecrackers just for the thrill of it because it was strongly discouraged in our household. I grew out of it and I was content in just watching from our house(it’s on a hill so I got to see alot of firework display).